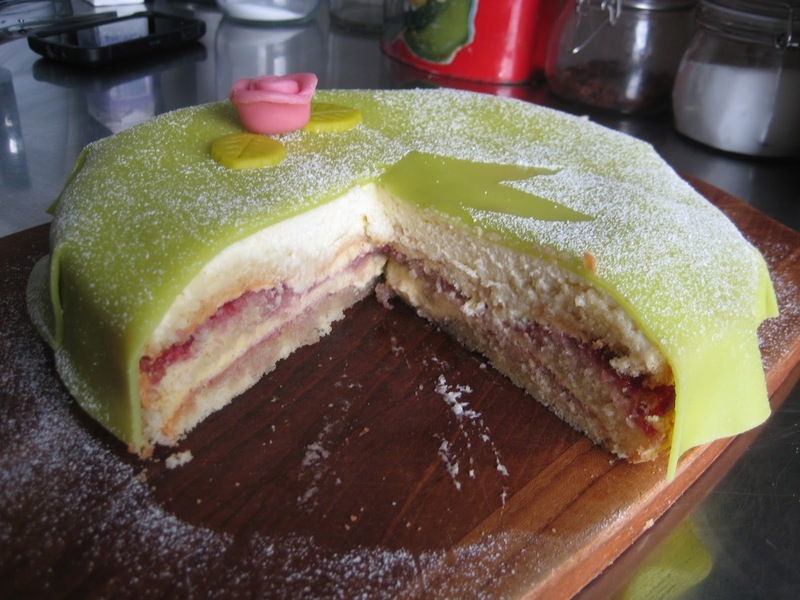 The Princess Cake contains multiple layers of sponge cake, raspberry jam, vanilla cream, whipped cream, and marzipan. It is usually green (the marzipan) and decorated with powder sugar. 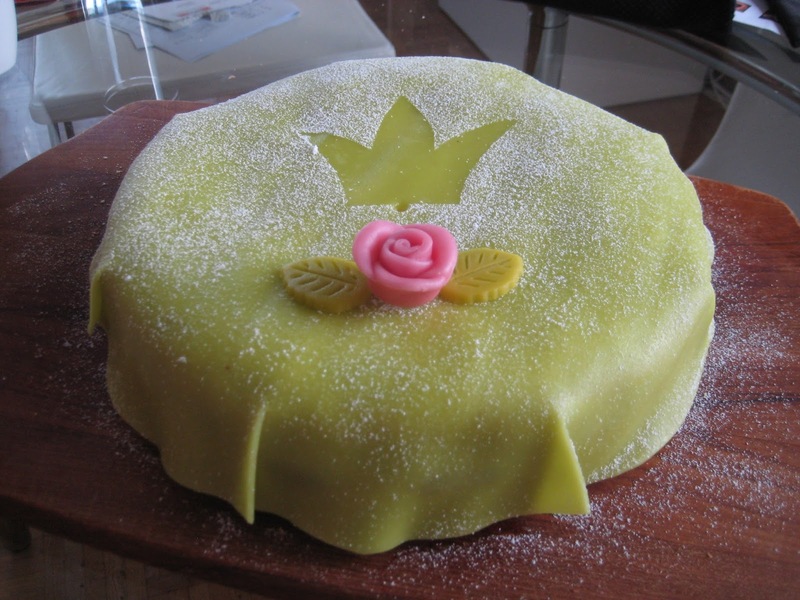 This cake is the traditional birthday cake in Sweden and is also eaten at other celebrations, such as weddings, in which case the marzipan is white. I thought it would be difficult to make but it was ok. The only tricky part is cutting the sponge cake in 3 layers. I prepared it last night so it would have time to cool down in the fridge until the next morning. It takes a bit of time because both the cake and the vanilla cream have to cool down before use so plan 3 hours. I bought already-made green marzipan but you can do it yourself, I'm sure it's better and less sweet. Try it and impress someone you love for their birthday! Mix eggs and sugar until white. Add the warm water at the end while beating. Add flour and baking powder (mixed together). Transfer the dough into a buttered and floured springform. Bake in the middle of the oven 30 min at 175C. Allow the cake to cool down. Heat up milk, cream, sugar, and vanilla seeds in a saucepan until it boils, then turn the heat off. Add eggyolks and maizena, whisk until the cream thickens (on the warm plate). Filter the cream through a sieve and let the cream cool down. Then incorporate half of the whipped cream (below) into the vanilla cream and carefully mix. Cut the sponge cake in 3 layers. As bottom, use an end with the baked side up. Spread raspberry jam on it and then one half of the vanilla cream on top. Repeat the 3 layers (again with a baked end of the cake upwards so the jam and cream don't soak into the cake too much). Finish with the 3rd layer (middle part of the sponge cake). Spread the whipped cream on top, trying to make it rounded, and cover the sides of the cake with cream as well. Carefully cover the cake with the sheet of marzipan and make small incisions on the sides of the marzipan to adjust it to the cake. Decorate the cake with some powder sugar and marzipan flowers. Et voilà, the Princess Cake is done!